Do you need a little mystery and crazy crime drama in your life? Then you need to check out these shows like The Following and watch as they try to track down serial killers and other seriously intense criminals. You’ll be on the edge of your seat and wondering if they’ll be able to pinpoint the real killer. The person you least expect, right? I also included which shows should be on your list of shows to watch on Netflix because I know most of us are always looking to add to our Netflix collection. TV shows like my fav shows are usually a sure bet. Check out a little more info about The Following, along with other TV shows like The Following below. The Following is one of the best TV crime drama series. This show premiered on Fox on January 21, 2013, and ended on May 18, 2015, after three seasons. 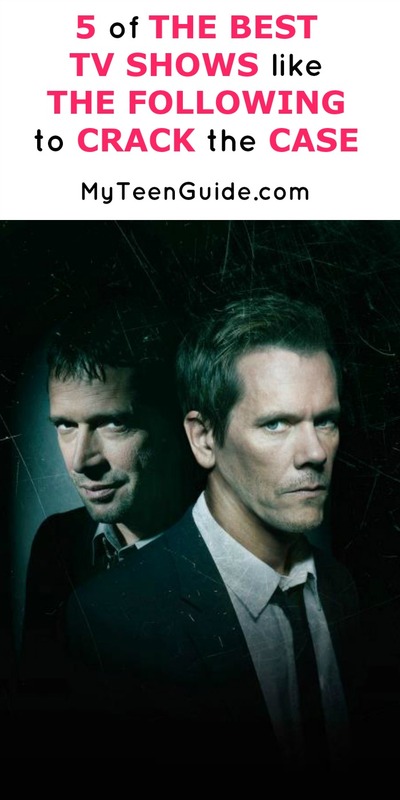 The show starred Kevin Bacon, as a former FBI agent named Ryan Hardy, who is trying to catch Joe Carroll, a serial killer, played by James Purefoy. Here are some other TV shows like The Following. Person of Interest is a both a science fiction show and a crime drama TV show. The show premiered on CBS on September 22, 2011, and will end on June 21, 2016, after five seasons. The series centers on John Reese, an ex-assassin and Harold Finch, a wealthy programmer, who team up together to save lives, obtaining their information from an AI computer system that only sends the team the identity of the perpetrator or the crime victim, leaving out the crime details themselves. Person of Interest stars Jim Caviezel, Michael Emerson, Kevin Chapman, Amy Acker and Taraji P. Henson. You can find Person of Interest on Netflix. CSI: Crime Scene Investigation is a police procedural drama TV series that premiered on CBS on October 6, 2000, and ended on September 27, 2015, after 15 seasons. The series focuses on a team of police forensic evidence investigators in Las Vegas, as they solve murders assigned to them by the Las Vegas Police Department. CSI: Crime Scene Investigation stars William Petersen, Laurence Fishburne, Ted Danson, Marg Helgenberger and Elisabeth Shue. CSI: Crime Scene Investigation, unfortunately, can’t be found on Netflix currently. Criminal Minds is a police procedural crime drama TV series that premiered on CBS on September 22, 2005. The series focuses on a specialized FBI Unit, called the BAU (Behavioral Analysis Unit), as they solve crimes by profiling the behavior of those involved in the crime. Criminal Minds stars Thomas Gibson, Shemar Moore, Matthew Gray Gubler, A.J. Cook, Joe Mantegna and Kirsten Vangsness. You’re in luck if you have Netflix, Criminal Minds is available to stream. The Killing is a crime drama TV series that premiered on AMC on April 3, 2011, and ended on August 1, 2014, after four seasons. The series follows an array of murder investigations conducted by homicide detectives Stephen Holder and Sarah Linden. This show almost feels like a true crime show; it feels so real. The Killing stars Joel Kinnaman and Mireille Enos. The Killing was picked up by Netflix from AMC, and season 4 was aired exclusively on Netflix. You can still stream The Killing on Netflix. True Detective is an anthology crime drama TV series and premiered on HBO on January 12, 2014. The series features a different cast, characters and setting each season, each dealing with police investigations in one way or another. Season One stars Matthew McConaughey, Michelle Monaghan, Woody Harrelson, Tory Kittles and Michael Potts while Season Two stars Colin Farrell, Taylor Kitsch, Rachel McAdams, Vince Vaughn and Kelly Reilly. Sorry, True Detective is not currently available to stream on Netflix, though if you have the disc option, you can watch it on discs through Netflix. Do you like to watch crime tv shows? Can you think of any other great tv shows like The Following? Tell me in the comments!